Everton Football Club and Manchester City Football Club (MCFC) of the English Premier League are early adopters of Premier Browser enabling Evertonian fans that use the web browser to earn credit for each purchase redeemable in the club store representing more than 1,000 retailers. A portion of each purchase can be donated directly to the club’s charitable foundation. The Sports Techie community blog had a chat with David Berney, CEO at Premier Browser Ltd (Part of Datagains Group Ltd) about their sports tech software downloadable on mobile, tablet or desktop on iOS and Android, and as an extension on Chrome, Safari, Firefox and Internet Explorer, created to allow sports rights holders to have a pioneering digital opportunity to engage with fans, help charities and gather relevant data for sponsors to increase ROI. The innovative web browser technology was implemented by Everton FC for the 2015 ‘Blue Crimbo Challenge’, a soccer social campaign to reward fans who sign up to the online browser then invite fellow Toffees friends and family to follow suit earning them credit to shop for must have Blues Christmas presents. Sports technology is constantly changing the EPL and MCFC fan experience, this time with a custom Premier Browser. Toffees boss Roberto Martinez and actress Amanda Holden are among a host of Everton players and personalities getting behind the Blue Crimbo Challenge, which has been developed in partnership with UK-based technology platform Premier Browser. Everton manager, Roberto Martinez and actress Amanda Holden are among several Everton players and personalities getting behind the Blue Crimbo Challenge, developed in partnership with UK-based technology platform Premier Browser. 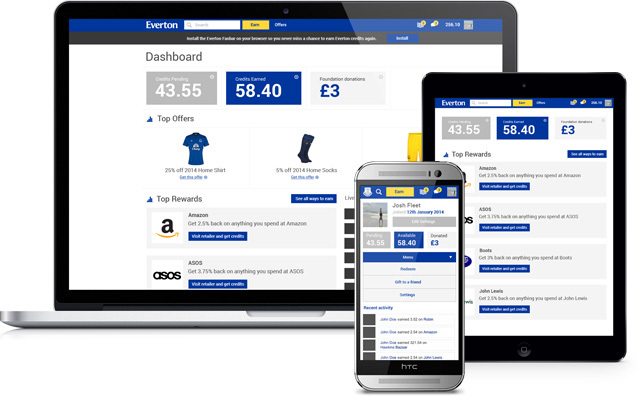 Sport fans who use the Everton browser earn credit from making purchases at more than 1,000 retailers, which can then be redeemed in the Everton club store. A percentage of each user’s spend is also donated directly to the club’s award-winning charity, Everton in the Community. The progressive franchise launched a new technology-driven fan loyalty campaign featuring Everton fan Holden, a judge on ITV’s Britain’s Got Talent show since its inception in 2007, and Martinez. The promotion was developed to meet the expected user adoption rate for Everton’s global club-branded browser. In the Blue Crimbo Challenge, every fan that gets three people to sign up as active users will get a free limited edition Everton t-shirt. Other prize draws include winning half-season tickets and a personalized video spoken from a favorite player. Measuring the stats of the first campaign as a test revealed that day one, some 2,299 entries signed up to win a t-shirt, 39% of these users shared on FB, 36% shared on twitter , 20% sent out invites by email, and another 20% invited via SMS and mobile. The affiliate cashback Everton Browser and toolbar solution was developed to be user-friendly and integrates into their digital portfolio while producing a new fundraising stream for Everton in the Community. The combination of a browser-based product in the clouds that offers financial benefits while enhancing the digital experience of their fans while at the same time supporting a favorite charity makes for an impactful application. The UK-based company delivers club-branded browsers designed to reward fans who shop, share and search online. Premier Browser Ltd is part of the Data Gains Group http://www.datagains.com. Premier Browser provides a browser that brings clubs closer to fans and sponsors. Fans get more out of browsing online, and the clubs get detailed reporting about what fans want, as well as when and where they are searching for it online. The cross-platform browser has given Everton and its partners a significant new opportunity to engage with its fans across the world through relevant, data-driven competitions and offers. Rewards last for one year for but when a user is active another year is added to the products expiration date. Everton and Premier Browser’s partnership success shined at the 2015 Football Business Awards, after earning the ‘Most Innovative Use of Technology’ award over Premier League rivals Chelsea and Aston Villa. The company partners with Kitbag, They welcome MLS suitors and any other sports property owners in the US looking fan engagement tied to international, domestic or localized data relevant to sponsors. Team executives using Premier Browser can expect a road plan for digital engagement and shopping built for a loyal audience, hungry for rewards. The Asian market such as Indonesia have many EPL fans but if they won tickets as a Premier Browser reward, it would require the winner to purchase a flight so the technology considers geo and location info in order to deliver sponsor relevancy based on data to happy fans. The proprietary product can help detour agnostic fans around the globe that change from team-to-team and player-to-player into fully dedicated Premier League and Everton fans like the purists. For more information about the Blue Crimbo Challenge or Premier Browser, please contact: info@premier-browser.com. Everton and Manchester City Football Club Implement Premier Browser – SportsTechie blog. Sports Techie, Premier Brower is gamification meets reward meets engagement. The goals are to incentivize the fan and help fans earn a reward while generating targeted data to give to sponsors, truly a win-win-win. Current users are sending spend less on Google and Facebook adwords and also receiving relevant data-centric campaigns where revenue is shared between the vendor, franchise and charity, Everton in the Community. Proprietary graph database show a user’s connections enabling fan bases to grow organically. McLeod spoke about a meeting with the head of their charity foundation who told a story of a girl that needed a bone marrow transplant. Everton opened the stadium for thousands of fans until a compatible blood donor was finally found amongst those in attendance. The Frank Bird story is about a UK roofer that built a roof for a local school free of charge because he loves the community and club. Fellow Blues respect his wish for no acknowledgement so when they search for a roofer on the club browser and find out about Bird’s deed, they often sign up for his services as a way to be thankful and engage with the community. New clients are coming on board from main land European club football organizations perhaps as soon as 2016, Jan.
Everton and MCFC fans are Premier League first’s, are you next.